A 51 year old lady walking with her 74 year old mother, became lost in blizzard conditions on the top of Greenup Edge, and requested assistance. Conditions on the fell were more akin to January than April, and just shows how one should not take the better weather for granted. 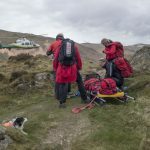 The Team sent groups from Rosthwaite and Wythburn, at the same time requesting assistance from Cockermouth and Langdale teams to boost numbers, as well as Lake District Mountain Rescue Search Dogs. 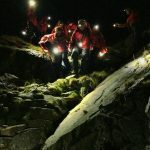 In the event, the pair were located quite swiftly by a Team member above Lining Crag. They were assisted by Team members down to Rosthwaite, then driven back to Keswick to catch the last bus to Grasmere. 13 Team members – 4 hours 51 minutes.